A few weeks back I received a huge package from Cindy the creator of Shimmer Polish with a whole bunch of polishes. It's going to take me a bit of time to share them with you, because I'm really liking these and I want to wear each one as an actual mani, rather than just doing swatches of them. The first shade I chose to wear is Linna. 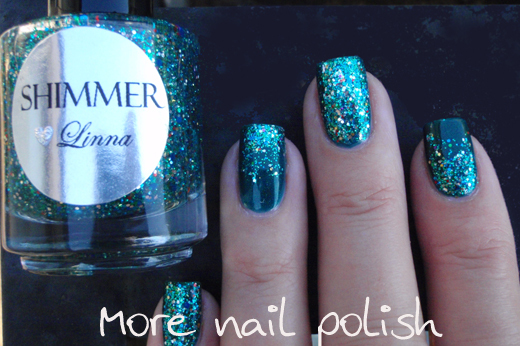 Linna is a predominately teal green glitter polish, but one thing I've learned already with these Shimmer polishes is they are beautifully complex. Along with the teal green glitters I can see blue, red, silver, pink and yellow. For this mani, the base polish I chose is actually a custom shade that Carrie from Contrary Polish made for me. It's called Glowing Water and it's the most stunning teal green shimmer polish, I haven't shown it to you yet, cause I didn't want to tempt you all with a polish you couldn't buy, but it was such a perfect match for this glitter I had to wear it again. This is one coat of Linna painted as a gradient on the index and ring fingers and two coats on both the middle and pinky fingers. The second Shimmer polish I wore is called Alice. 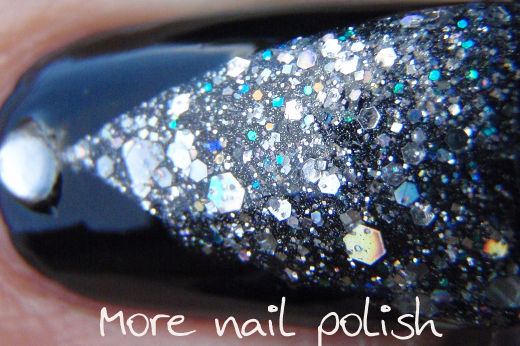 Shimmer polish describes Alice as a discoball silver holographic glitter polish with stars, and that's exactly what it is. Lots of different sizes of silver holo hexes together with holo stars (and I swear I also see some small blue iridescent glitters too). I actually did get one or two stars out when I was doing this mani, but I decided to take them off my nail for this design. I started with a black base and then taped off the long chevron design. I then applied one coat of Alice before removing the tape. 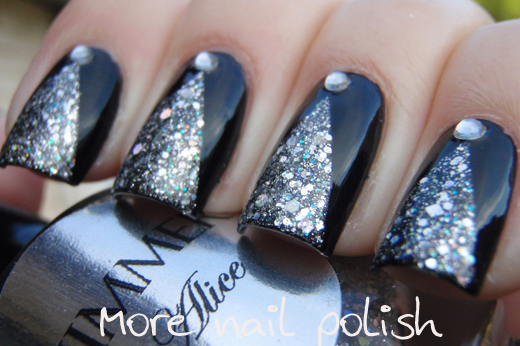 I then added silver rhinestones at the top of the nail. I was a little worried that these looked a bit Christmas tree like, but during the course of the day the design really grew on me and simply looked more abstract than tree like. 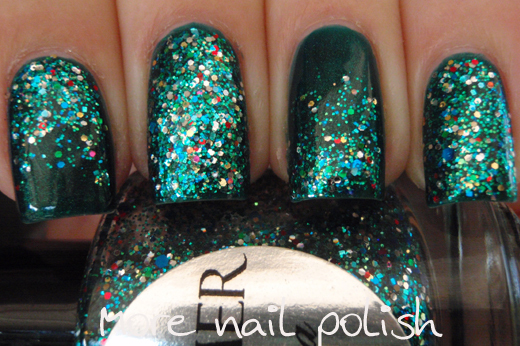 One thing I really like about the Shimmer brand is that she has chosen the style of her polishes and stuck with it. They are all various colour mixes of micro, small and occasional medium sized glitters, there aren't any chunky glitters. 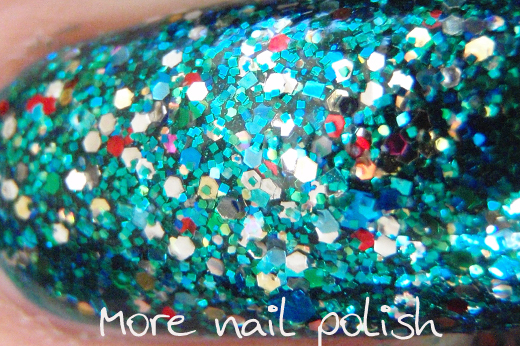 The fine glitters make these perfect for gradients and tape manis. 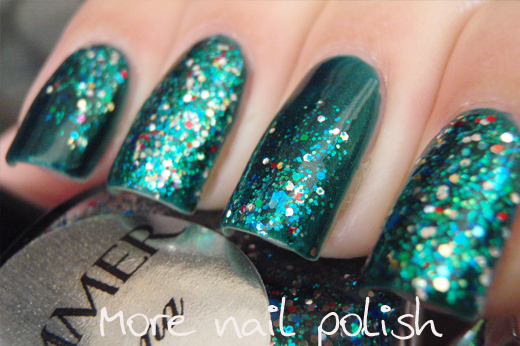 Shimmer Polishes are available from her Etsy store and are $12USD for full sized bottles. I'd like to showcase the remaining Shimmer Polishes in some sort of 'arty' way (like the above manis), rather than just straight full nail glitter manis, but I'm struggling to come up with other ways to wear them. 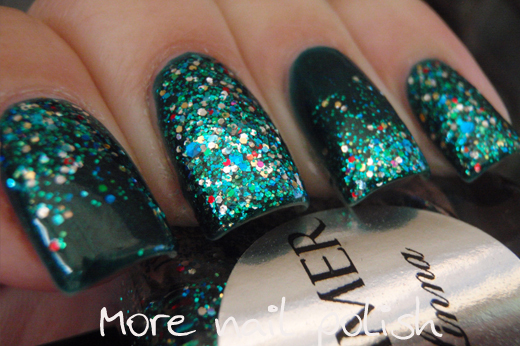 Anyone got some good ideas I can try for wearing fine glitter polishes like these? The last one is very pretty ! Wow, these are gorgeous! I love what you've done with the last one in particular! I looove the gradient mani!! So pretty!! Very pretty! I'm really digging all the sparkle polish! Both manicures are lovely but I love the gradient one the most :). I loved both nails !! Well done !! Thanks for the awesome swatches! Can't wait to see more. Your designs are brilliant! Have you ever tried this nail polish: http://www.maxiglam.com/ZOYA ? I'm interested to know if the same effects can be achieved with it. Thanks!